Rarely has Indian badminton had such a good day in an international tournament, as Thursday proved to be, at the Australian Open Superseries championships in Sydney. Every one of the country’s four singles exponents still in the fray after the opening round – Kidambi Srikanth, Bhamidipati Sai Praneeth, Pusarla Venkata Sindhu and defending women’s singles champion Saina Nehwal – vaulted their second-round hurdles in style, and barged into the quarter-finals. With Srikanth and Praneeth scheduled to face off against each other on Friday, there is the certainty of at least one Indian in the semi-finals. The two Indian losses on the day were suffered by the men’s doubles combination of Satwiksairaj Rankireddy and Chirag Shetty, who went down fighting to the eighth-seeded Chinese Taipei combination of Chen Hung Ling and Wang Chi Lin at 16-21, 18-21; and the women’s duo of Ashwini Ponnappa and N Sikki Reddy, who were sidelined by Japan’s No 7 seeds, Shiho Tanaka and Koharu Yonemoto 21-18, 18-21, 13-21. Sindhu went her prodigal way, accounting for China’s Chen Xiaoxin 21-13, 21-18 in 46 minutes, with the second game alone taking nearly half an hour. The 21-year-old lanky Indian, who has moved down one rung to No 4 in the latest Badminton World Federation (BWF) rankings, continued to give her supporters minor angina attacks by blowing big leads and struggling to close out her match. The Hyderabad-born shuttler powered ahead after 13-10 in the opener to 17-11 and 19-12, before pocketing the opening game. With the Chinese player improving her on-court performance after the change of ends, the scores were locked at 10-all, but Sindhu moved smartly up from 15-14 to 18-14, only to suffer her by-now-customary end-game blues to allow Xiaoxin to narrow the gap to a single point at 18-19. Fortunately, the Indian maintained her composure to settle the issue at 21-18 and progressed to a quarter-final meeting with the top seed from Chinese Taipei, Tai Tzu Ying, who totally dominated the exchanges with Thailand’s 2013 world champion, Ratchanok Intanon, before scoring a 21-11, 21-18 victory. Sindhu has her work cut out for her, as the 22-year-old Taiwanese star has won six of their previous nine meetings, including their two most recent clashes in straight games. Saina, who slipped one more spot from last week to No 16 in the rankings, was far from convincing when handing out a 21-15, 20-22, 21-14 defeat to Malaysia’s 26th ranked Soniia Cheah in 62 minutes. The 27-year-old Indian ace had every opportunity of closing out the match in straight games but allowed the Malaysian, three years her junior, sufficient leeway to grab the middle game. Normal service was restored in the decider, but the lapse in the second game did not bode too well for the Indian, who takes on China’s No 6 seed, Sun Yu, on Friday. Saina carries an imposing 6-1 career head-to-head record against the 23-year-old Chinese player, including a three-game victory in their most recent encounter, the 2016 Australian Open, at which the Indian scaled the summit. 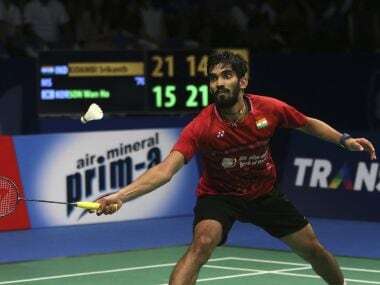 While both Indian women were rather less than impressive in their pre-quarter-final outings, the stand-out Indian performance of the day came from Srikanth against South Korea’s current world No 1 and top seed, Son Wan Ho. In a matter of 57 minutes, that is, a full 19 minutes less time than he had taken against the same player at the Indonesia Open last Saturday, the Indian wrapped up the encounter by a 15-21, 21-13, 21-13 scoreline. If one were to look back dispassionately, there could well have been the admission of an element of the fluke in the 24-year-old Indian’s Indonesia Open win over Wan Ho, for the Indian had had to save a match-point in the deciding game of their semi-final clash before crossing the finishing line at 24-22. A mere five days after that thrilling, long-drawn battle, Srikanth got a second chance to show the world that, despite his relatively low 11th ranking in the BWF charts – which, nonetheless, was a huge improvement over his 22nd rank last week – he was superior to the (on paper, at least) world’s premier male badminton player. And this time, nobody could call his performance a flash in the pan; Srikanth was totally authoritative in his execution of the coup d’état. For the second tournament in a row, Wan Ho failed to live up to his top rating, as he went down to the same player who had ended his campaign in Jakarta. The victory underscored the Guntur lad’s triumphant return to the top of the heap, where he rightfully belongs, after the lengthy and often frustrating, rehabilitation period that followed his right ankle injury in September last year. With Srikanth restoring his head-to-head score with the Korean to an even 4-4 after eight meetings, the stage was set for an all-Indian quarter-final after B Sai Praneeth had the full measure of China’s Huang Yuxiang while notching a 21-15, 18-21, 21-13 win. It meant that their clash on Friday would be a repeat of the Singapore Open final, which Praneeth had won in three games on the strength of his superior stamina. Although this second meeting in two months between the two Pullela Gopichand Academy batch-mates and sparring partners does guarantee the presence of an Indian in the Australian Open men’s singles semi-finals, it would have been so much better if they had been in different halves, so that they could have clashed only in the final. The manner in which the Indian shuttling brigade has been playing of late, they had every chance of taking all-comers in their stride until the summit clash. – Sai Praneeth won the Singapore Open Superseries title, beating Kidambi Srikanth in the final in mid-April. – Sai Praneeth bagged the Thailand Grand Prix Gold title in the first week of June, beating Indonesia’s Jonatan Christie in the final. – Kidambi Srikanth pocketed the Indonesia Open Superseries Premier crown last week, eclipsing Son Wan Ho in the semi-final and Japanese qualifier Kazumasa Sakai in the final. – H S Prannoy lowered the colours of two former world No. 1’s – Malaysia’s Lee Chong Wei and China’s Chen Long – in successive rounds of the Indonesia Open, before he bowed to Sakai after holding five match-points. – Every one of the world’s top players had taken part in the cash-rich Indonesia Open, and several of them – including Son Wan Ho, Chen Long, Lin Dan, Shi Yuqi and Jan O. Jorgensen – are playing in the ongoing Australian Open. But then, if you are unseeded among the top eight in a 32-player field, the luck of the draw makes so much of a difference. In the same manner as Srikanth and Praneeth got lumped in the same section in the top quarter of the draw, the two Chinese greats, Chen Long and Lin Dan, have been grouped in the third quarter of the draw, and are slated to bump into each other – since both are unseeded! 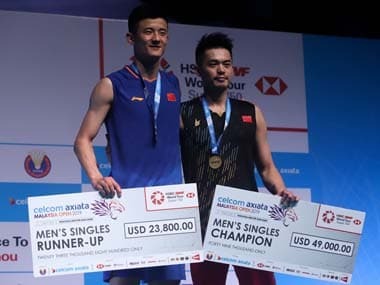 It must be a fair while since China’s two-time reigning world champion and Olympic gold medalist Chen Long were unseeded in a tournament. That, however, is the punishment for picking and choosing which tournament to play, with seedings being determined solely on the basis of rankings, which in turn are worked out on the strength of points gathered during the course of a season. Long handed out a 21-10, 21-13 thrashing on Thursday to Indonesia’s Anthony Sinisuka Ginting, who had scalped Denmark’s fifth-seeded Jan O Jorgensen in his opening round. Super Dan was not unduly troubled in his own lung-opener by Korean Lee Dong Keun, who had been promoted from the qualifying rounds because of holes in the draw through withdrawals; and then eased past Jonatan Christie of Indonesia on Thursday with a score of 21-14, 21-19. Th 28-year-old Long had outlasted his 33-year-old compatriot in the final of the Badminton Asia tournament, a month-and-a-half back. The living legend that Lin Dan is, he must be spoiling for a fight, especially with the Glasgow World Championships, exactly two months away, beckoning him for a sixth title.